In 2004 EDN and NEC held the Cornelius van Drebbels Mad Design Contest. 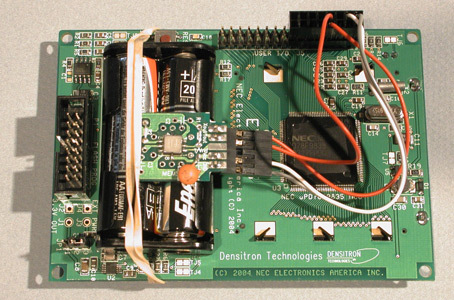 The idea was to use one of three NEC development kits to show off their microcontroller. The coolest of the three was the EV9835, because it had a 48x48 pixel LCD display. I had a Memsic tilt sensor, a free sample that'd been sitting in a drawer for a few years. I pulled out the data sheet, and it proved to be stunningly easy to hook it up to the NEC board: Just Add Wires. The photo on the right shows my high-tech mounting system. Casting about for applications, a friend pointed me to Andrea Gilbert's ClickMazes, in particular her Tilt mazes. These proved to be a perfect match, and the simpler versions work well with the low-res display. The detailed technical write-up for the contest is here (PDF, 277K). A movie of the Tilt maze application in action is here (QuickTime, 7.5MB). 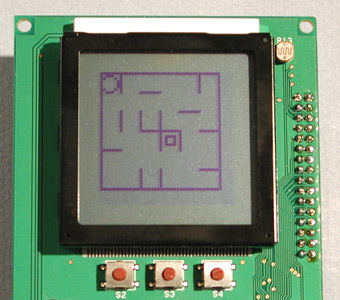 In order to create mazes for the EV9835, I created a maze editor in Python/Tk.